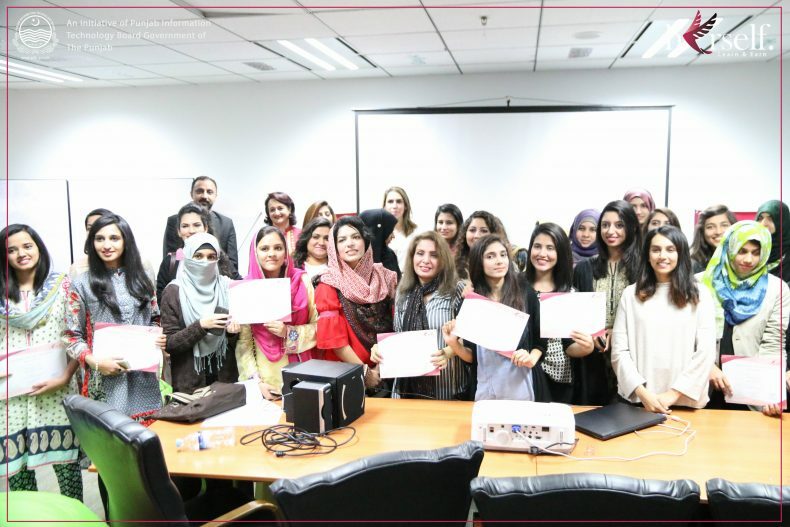 Herself, a program to empower women in Pakistan, organized a Graduation Ceremony for their second cohort comprising of 60 passionate women. In six months, the program has trained 100+ women by providing them with entrepreneurial and pre-incubation training from professional trainers. The graduation was officially kicked off by Zainab Tariq, Co-Manager Herself and Ayesha Mubashir, Marketing & PR Executive, Herself. They took the stage to address the audience about the program including the vision, progress, partnerships and future plans. Dr. Umar Saif, Chairman Punjab Information Technology Board, joined for an opening speech in which he discussed the entrepreneurial culture in Pakistan along with the role and importance of women in the workforce in his opening speech. He appreciated the efforts of all women who contributed in making the cycle a success and encouraged them to fly high in the future. He said “No economy can ever progress if its women don’t progress and with little job opportunities, venturing into entrepreneurship would benefit the society as a whole”. Next, a Business Idea Competition was held among three trainees of the second cohort in which each of them presented their own business idea.